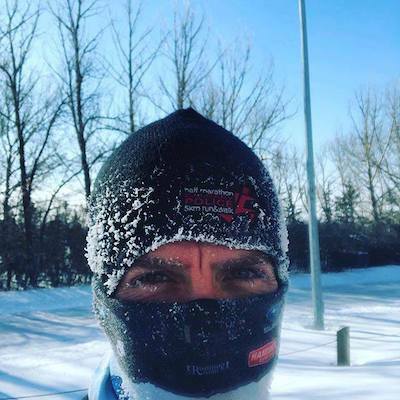 Dr. Mark trains for his ironman goals even in the dead of winter -with the support of his coach. Maybe you are passionate about running a marathon. Or perhaps you’d like to be multilingual. Since you’ve been a child maybe you’ve dreamed about being a pilot. My goal has been to participate in triathlons. For about 15 years I’ve been competing in these physically demanding events. When I first started, I was a novice. I struggled to do two lengths in the pool without taking a break to get my heart rate back down and catch my breath again. I’ve progressed gradually over time and do long distance IRONMAN® triathlons. This year, I will be doing my 8th full distance one. I’ve also competed in about 25 Half Iron Distance Triathlons. Though it may sound like an obsession, participating is now part of my lifestyle. It’s an activity that keeps me inspired. When people ask why I do the long distance triathlons, I say one big reason is I’m inspired by the other people you meet. With the IRONMAN events you meet many people who are amputees or are in their 70s or 80s. One competitor is Sister Madonna Buder and she has become well known. She’s 88 years of age and still participating in triathlon events! She didn’t learn how to swim until she was in her 50s. Sister Madonna Buder is truly inspiring. One of the taglines of IRONMAN is “Anything is Possible.” She certainly proves that! Whatever you aspire to do the possibility is there so long as you put in the work. I’ve progressed gradually through the years and have gotten to the point where I’m now in the somewhat competitive category. As an ‘age grouper’, my big goal is to get to the world championships of the IRONMAN which happens in Hawaii every October. I’m getting close but not enough yet to be in the top 2 or 3 in my age group. Last year I was 12th in my age group out of approximately 170 competitors. I recognize that there’s more work to do, and even if I don’t achieve the ultimate goal, I am becoming a better version of myself in the process. To help me achieve my goal of competing in Hawaii, I’ve been meeting with an experienced coach who has set numerous records for his own racing. He’s coached for over 25 years and has won awards for his coaching. This season is my third with him, and we meet once a month. We go through the training I did the previous month and then decide what should be done for the coming 4-5 weeks. In addition to benefitting from his knowledge, I’m getting accountability. The likelihood of me doing the workouts would be a lot lower if I didn’t have to report back to and meet with the coach. I believe coaching in different areas of life is an excellent way to find greater success. That could be in sports, in relationships, in work, or other areas. Because of being coached, in the past few years, I have reached a higher level of success in results. I’m looking forward to seeing how I do in this year’s Ironman Canada taking place in Whistler, British Columbia. Consider setting a big goal for yourself. It should be one that scares you, but is somewhat attainable. Even if you strive for achieving that big audacious goal—even if you never get there—you become a better version of yourself. You don’t need to get obsessive about it. At our practice we encourage our patients to dream and stay connected to their goals!